He was right, as we started heading south the clouds opened up and the stars filled the sky. I had spotted Orion’s belt through the clouds, and the next time I glanced up the constellation of Orion filled the sky. The stars proved useful for steering as well, giving me a reference point for direction that had been missing in the foggy or cloudy conditions we usually find ourselves traveling in. As we approached the cape, the winds started to pipe up again, and the feeling of “not again” crept into both our heads. I took the helm as Jenn went below to sleep, after a brief watch change chat where we agreed not to turn back just yet. By the time Jenn woke up, we had rounded the cape and the winds were subsiding. While we didn’t get the light winds and flat seas NOAA predicted, we were able to continue forward, but our average speed was not what we had targeted. I did manage to bring the speed well over our goal by motorsailing for a bit, but the wind direction was causing us to slowly head further off shore than we wanted to be for this leg. As I came up from my two hour nap a bit after daylight, Jenn informed me we were being escorted by about six to eight dolphins, that would come near the boat, veer away, then return. 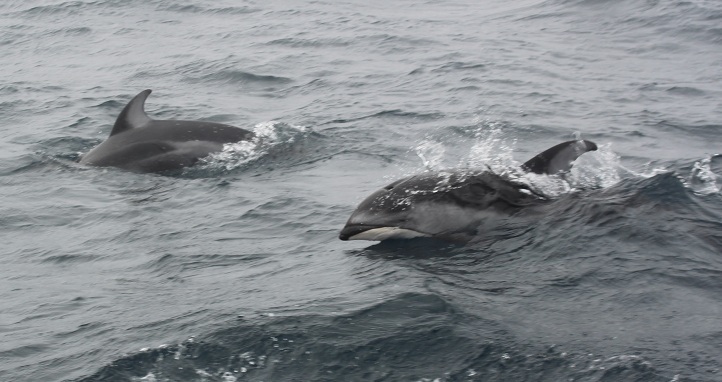 They were not in sight when I came up, but returned shortly after and spent another hour or so coming as close as a couple feet to the boat, jumping out of the waves and causing us much delight. While not as impressive as the huge school we saw from a distance early in our trip, it was delightful to see them mere feet away from us. After more consultation, we decided to stop at Fort Bragg, 97 miles from Eureka but well short of Bodega Bay. We plotted a course for the entrance (ok, the GPS plotted it) and started heading for yet another bar crossing. I took time away from the helm to study the entrance, and we checked the tides. We were going to arrive just a bit early so we slowed up just a bit so we would hit the entrance around slack tide, turning into a flood. We called the Coast Guard for a bar report, and after being questioned about our position, vessel description and number of people on board, received a favorable report. Now the only issue remaining was the the guide books recommendation to not enter this harbor at night, or during rough weather if you hadn’t done it before or didn’t have local knowledge. The weather was calm, there was reasonable visibility, and our chart plotter and radar have been spot on telling us where we are and what is around us. Plus we got the big spot light out in case we needed to light something up near the boat. We spotted the entrance buoy lights a few miles away, and crept towards them. Distance on the water at night can be difficult to judge, and once you see a light you don’t expect another hour to reach it, but that can be the case. Finally we were close enough to turn towards the entrance. The Fort Bragg entrance starts as a bay with reasonable width at the coast line, and narrows to a channel I’m guessing is 60 feet wide between two rock walls. It seemed simple enough, there are plenty of lit navigation marks, but picking them out with lights of the town in the background causing us to both think we were heading towards a wall that didn’t exist at one point proved a bit tricky. Finally we were in the narrow entrance channel, heading towards a fixed bridge we had to cross under. “How tall is that bridge?” Jenn questioned. “80 feet according to the guide book” I replied. “Are you sure?” she asked. “I’m sure the guide book said 80 feet.” My mast is 54 feet tall, and it was low tide so there shouldn’t be any issue, and while it appeared it would be close, it really wasn’t as we slipped under the bridge. Two more red marks in short succession to our right, and we were in the harbor. Or creek, as someone who emailed me referred to it. Our boat continued up the waterway, probably 75 feet wide with pilings rising out of each side to support docks with fish processing buildings, fishing boats occasionally tied to the pilings. Although only about 10:30 pm at night, we saw no signs of life. It was a bit eerie, gliding through civilization but not seeing any movement. As Jenn was preparing the boat to tie up to a dock, she suddenly informed me she had dropped a fender. I glanced back and saw one of the new fenders, which we have already somehow lost two of, floating behind us. Despite the narrow channel, we spun around, retrieved the wayward fender, and turned back up the creek. We finally arrived at the marina, and as I peered to my left trying to determine if this was the proper spot to enter it I made the mistake of not being fully aware of my surroundings. Determining that this probably was the entrance, and luckily having started to drift to starboard to turn in, I looked back up and saw the wall of the marina breakwater a couple feet from my bow. I can’t use darkness as an excuse since there was a charted large red light on top of the wall. I swore in a way Jenn isn’t used to hearing, and went hard to starboard, and watched in slow motion as the boat slid past the wall, passing less than a foot from the port side of the boat. Sighing with relief of learning a lesson without actually damaging anything, I tucked away a note in my head to pay more attention to both sides of the boat in the future. We eased between the two docks with the transient label in the guide book, not seeing much in the way of available slips. As we reached the end of the waterway and I begin to turn around, I noticed an empty slip behind us, and managed to get the stern of boat close enough for Jenn to jump to the dock with a line (backing some sailboats up, including this one, is a bit of an art, and I’m not yet much of an artist). I joined her with the stern line and we began pulling the boat back into the slip. After some strenuous pulling on my part, I realized the boat wasn’t moving. 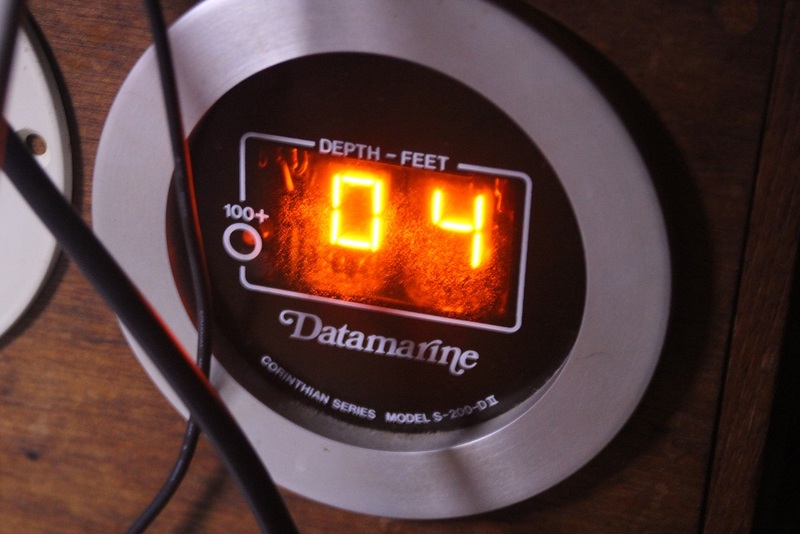 I hopped back on board, and looked at the depth sounder. Four feet. I grabbed a winch handle, and ground the keel up. The boat was then able to continue back into the slip. Thank goodness for the swing keel! We were at the bottom of a minus tide, so we should be okay for the rest of our stay. So here we are, waiting for weather for the next leg. If we get a short window, we’ll head for Bodega Bay, if the forecast is right and we start getting some wind at our backs in a few days, we may try to make up some ground and sail for Half Moon Bay. We spent a lazy day of grey rainy weather that would make Seattle jealous recovering from our trip by laying in bed reading, and met up with some other cruisers for dinner at a local Mexican restaurant. Today is back to some projects, exploring a bit, and maybe some provisioning. The life of a cruiser is just non stop!